As one of the largest UK pub and restaurant operators, Mitchells & Butlers has apprenticeship schemes as tempting as the food we serve! Our apprenticeship schemes are offered by all of our brands throughout the UK. We want you to aim high, so we've created a clear, structured career path that lets you set your goals and get where you want to be. Our training is accredited up to degree level. So whatever level you're at, we'll make sure you've got the skills to do a brilliant job. Here's what you'll get: Structured Induction Programme for all staff. E-learning modules, so you can learn flexibly online. Team Leadership programme so you can progress to a management role. NVQ's in a range of subjects and other industry professional qualifications such as WSET (wines and spirits education) are also available. The Management team of the business you are placed in. Your dedicated LifeTime trainer, who will assess how you are getting on and support the development of your functional skills in Maths, English and ICT. The rest of the apprentice community through training events and our online social network FUSE. "We believe that happy, satisfied employees make for happy, satisfied customers. And that's why we provide all our staff with training and career development that is second to none." What's it like learning your trade on the job with Mitchells & Butlers? In time for 2016's National Apprenticeship Week (March 14-18), we meet teen trainees Mitchell Woodward and Chad Beesley. Both are doing our 3-year Hospitality Management Development Apprenticeship (HMDA)- a scheme designed to fast track apprentices into supervisory roles whilst giving them exposure to all job roles within hospitality for them to make an informed career choice suited to their skills and personality. Now a chef at All Bar One Birmingham Airport, 19-year-old Mitchell says: "I've always been passionate about cooking. After realising university wasn't for me, I joined M&B as an apprentice. I loved the idea of earning while I learn, and the HMDA seemed like a great career move. My ambition is to be a kitchen manager in a really busy restaurant, or maybe a kitchen-skills trainer – with M&B there are so many opportunities. After finishing a college course in engineering, 18-year-old Chad started earning as a pot wash at a local competitor, he got the taste for the industry an joined M&B as an apprentice at The Victoria in Birmingham. "I enjoyed the role and working environment so much," he says, "that it led me to starting the HMDA. I want to own my own pub one day, so doing an apprenticeship will help me work my way up quicker. And with a great company that'll help me reach my true potential." Training includes on-the-job skills taught by the management team and the on going support of a regional trainer from the M&B training partner 'Lifetime Training'. There are also M&B's bespoke online workshops which focus on softer skills like personal reflection and development. Plus mini assignments and workbooks you complete with regional trainers. For both apprentices, one big challenge is the non-standard hours. "Being at an airport," says Mitchell, "we operate on different hours to most of the other M&B businesses, I sometimes start work at 3am with food prep, and we're open till 9pm. This can be demanding, but I wouldn't change my job for the world." Chad smiles: "We're busiest at weekends and public holidays. But all the hard work will be worth it, one day, especially when I'm running my own business!" And both enjoy the variety. Mitchell says, "I love learning new things – how to open and close a kitchen and work under pressure. One highlight was running the kitchen on my own, and I'll soon be working front of house." For Chad too, "It's great to get exposure to all areas of the business. Every day is different." Mitchell reckons that to be a successful M&B apprentice, "You must be passionate about hospitality, as it's very hard work in a fast-paced environment. Ideally, get work experience before committing yourself so you know what the job's really like." 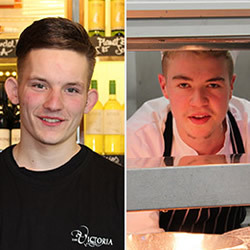 Our partners, Believe in Young People offer work experience placements so you can find out if hospitality is for you. And Chad agrees. "Late nights and early starts mean long days," he says. "Stress in the kitchen is a bit more than I expected, but I enjoy it and have quickly grown in confidence and knowledge. Doing an apprenticeship is well worth while, and I'd advise anyone thinking about it to crack on and get involved." When you go back to be with people not once, but twice, it must be true love. Just ask Chris Griffin, Head of Culinary Education, who's re-joined Mitchells & Butlers for the second time. While away, he's worked with some of the country's most celebrated chefs. 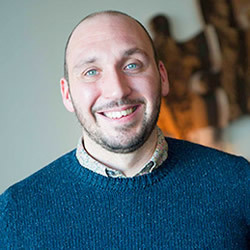 Chris says: 'What I love best about M&B is absolutely the people. Plus when I was a young chef, then a trainer, then in HR, the business gave me chances to develop my skills and go on to bigger, really rewarding positions. Flame keeps burning. "M&B also gave me my first role in training, with Vintage Inns, and the opportunity to look after food and kitchen policy across the business. So I have a soft spot for M&B, and if I can repay the favour that would be great." Wooed by a rival. Part of the time he was away, Chris worked at Compass Group, where he managed culinary training across all its brands. Here Chris worked with celebrated chefs like Jason Atherton and Gary Rhodes. Chris says, "We catered at sports stadia, large music events, award ceremonies, defence facilities, schools, hospitals – the full spectrum. Compass required all kinds of culinary skills so I was brought in to help develop those." Chris also spent three years at Hugh Fearnley-Whittingstall's River Cottage where he set up a culinary academy. "It was fantastic," Chris says. "We improved the futures of young people some of whom had been through some tough periods of their lives. Giving them best-in-class training and returning them to industry was so rewarding. We hoped some would become head chefs, making their own decisions about menu development and food procurement. And we succeeded." As our Head of Culinary Education, Chris is committed to improving the business's food knowledge and capability. To do that, he's planning a food college for M&B people. "I want it to be the best in the industry," Chris says, "where we'll create activities and learning programmes for chefs to develop great food skills." He's also ensuring everyone, across M&B, considers food quality and delivery a top priority – not always an easy task in an operation as big as ours. What has Chris enjoyed most about his M&B third coming? "It's great to see familiar faces and it's certainly helped my re-introduction into the business," he says. "We tend to retain good people and they enjoy working here. Socially, it's been great coming back." Chris has some advice for any M&B newcomers too. His top tip is: "Understand the difference between right and wrong, and have conviction in your opinions. If you can develop the confidence to be able to say and do what you believe is right, and combine that with hard work, you've got a brilliant future." "Through our people strategy we are striving to attract, develop and retain the best talent. Everything we do as a business is built on the enthusiasm and professionalism of our people."